"Burton was known for his travels and explorations within Asia, Africa and the Americas, as well as his extraordinary knowledge of languages and cultures. 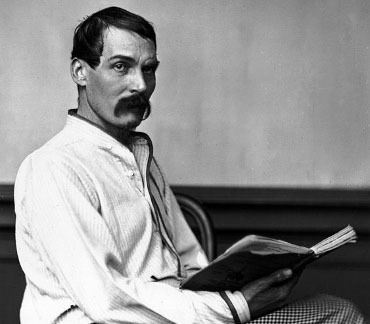 Burton's best-known achievements include a well-documented journey to Mecca, in disguise at a time when Europeans were forbidden access on pain of death; an unexpurgated translation of One Thousand and One Nights (commonly called The Arabian Nights in English after early translations of Antoine Galland's French version); the publication of the Kama Sutra in English; and a journey with John Hanning Speke as the first Europeans to visit the Great Lakes of Africa in search of the source of the Nile." English explorer and diplomat (1821-1890). 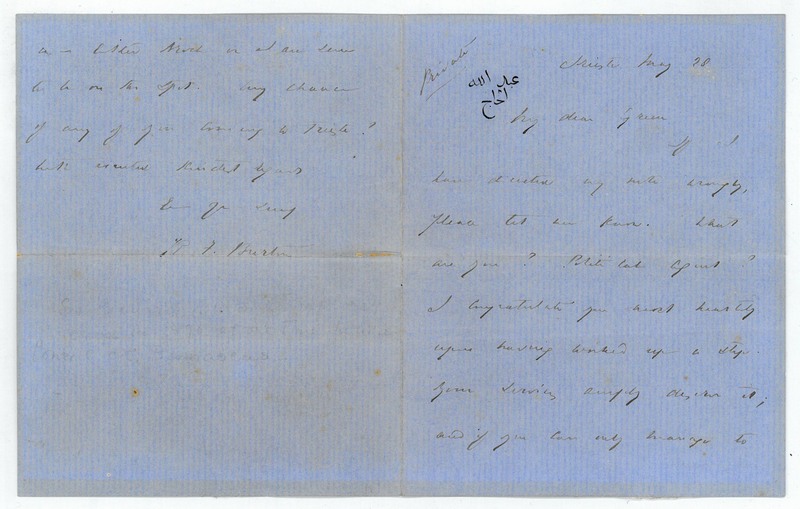 Autograph letter signed ("R. F. Burton"). Trieste, Consulate. 3 pp. Small 8vo. On his blue notepaper with his Arabic heading. To the publisher and author George Bentley (1828-95), stating that he has "polished up Scinde, now 'Sind' or the Unhappy Valley, that is I have almost re-written it. As your late father was the first to publish it I think it only fair to offer it to you. The augmentations will fatten the volumes, and I have a lot of photographs and old sketches (caricatures of Sir Charles Napier etc.etc.) which I think might be introduced with advantage, but are you inclined so to do? [...]". 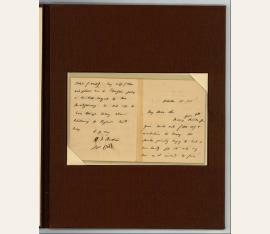 He says he will wait, "before giving the last touches to the book and then send it [...] When you receive it you will make up your mind and let me know [...] I shall probably be at Trieste for some time, but residence is always doubtful under the F.O. After Iceland, 6 months in India & Sind a little rest is of course desirable, to get it however is the difficulty [...]". - Burton brought Napier much detailed information on wife killing and bizarre reality although Napier had signed the death warrants of several rich convicted murderers. Napier was impressed by Burton's reports and would accept counsel from him. Burton, for example, suggested that Napier continue the practice of killing a murderer by shooting him out of a cannon rather than hanging, as a lack of proper burial would mean the Muslim would never reach paradise. Napier was disturbed by reports of homosexuality amongst the Muslims. Certain reports spoke of male brothels in Karachi which were corrupting the troops, and Napier asked Burton to investigate. Burton agreed to do this on the "express condition that my report should not be forwarded to the Bombay Government, from whom supporters of the Conqueror's policy could expect scant favour, justice, or mercy.". English explorer and diplomat (1821-1890). 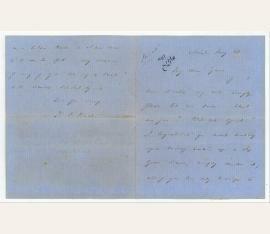 Autograph letter signed ("R. F. Burton"). Trieste, Consulate. 3 pp. Small 8vo. 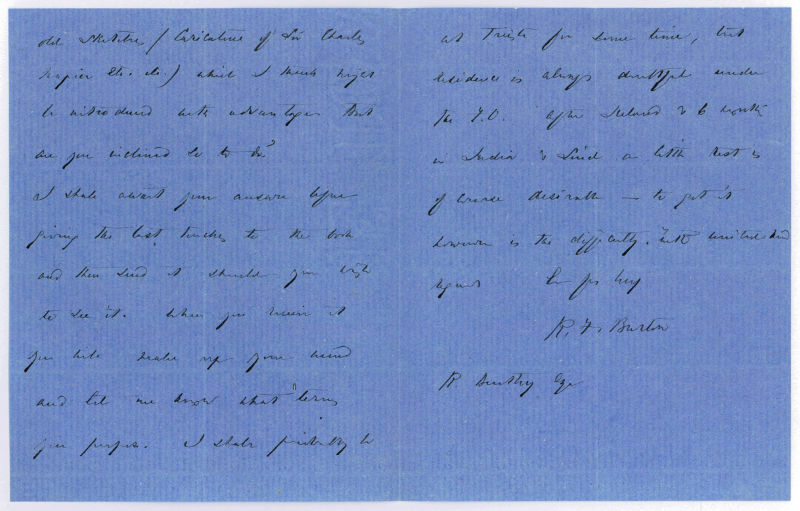 To the publisher and author George Bentley (1828-95), complaining that his "letter has certainly miscarried. I accept the conditions provided we print at once [...]". He asks for an "agreement to settle at the end of six months or a year and to allow me a dozen copies for friends. Could we manage to print without destroying the two old volumes. Of course you can take them to pieces and I will have them rebound when you have done with them [...]". He continues, "For corrections a single revise will suffice. 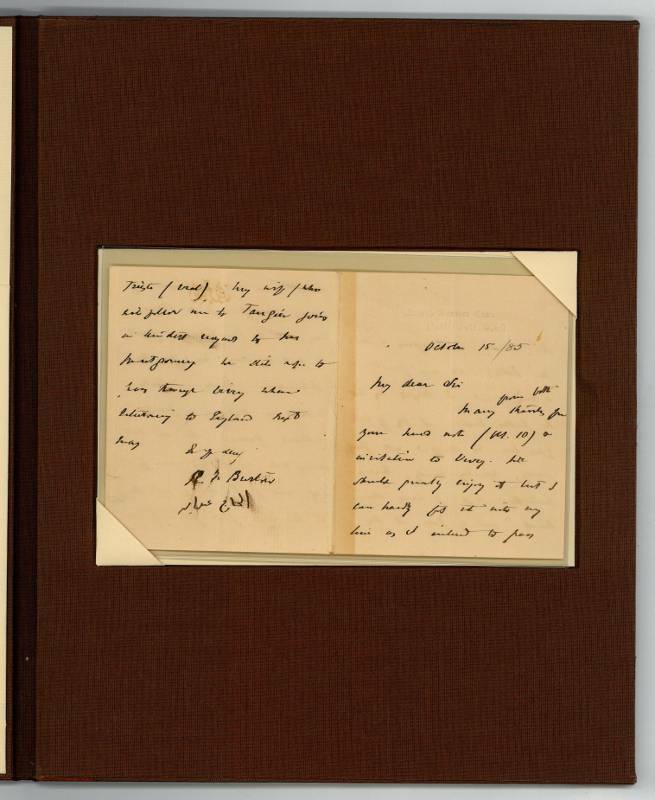 Kindly let me have proofs in duplicate accompanied by the manuscript - which saves time [...]." He asks his opinion on illustration, and repeats that he has sketches and photographs suggesting that "perhaps the best way would be to prefix one to each volume, say Sir Charles Napier to vol. I and the photo of a Sindi girl to vol. 2 [...]". He offers to send them off at once if it suits..
English explorer and diplomat (1821-1890). 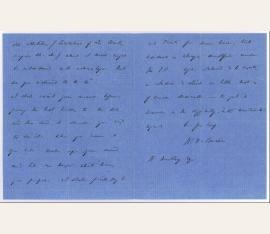 Autograph letter signed ("R. F. Burton" and in Arabic). [London]. 16mo. 4 pp. on bifolium with United Services Club embossed letterhead. In custom quarter morocco folder. To Colonel Montgomery, referencing the success of the "Arabian Nights": "[...] To my great astonishment The Nights has hit the public taste: it has of later years been so stuffed with goody-goody, namby-pamby Maria-Matilda that it wants 'strong meat' and by Jove it has got it. We had the pleasure of seeing my good friend Thayer here and I (unhappily) forgot to put his name down for the Athenaeum Club - London without a club is like a park without games. We are both living well under influence of beef and port (wine) and shudder at the lean flesh pots of Trieste (veal) [...]". - Burton published his famous translation of the "Arabian Nights" ("The Book of the Thousand Nights and a Night") in a private printing for the Kama Shashtra Society in 1885. The private publication, by subscription only, was necessary to avoid Victorian obscenity strictures. - Reinforcement at fold, a little smudging to signatures..
English explorer and diplomat (1821-1890). 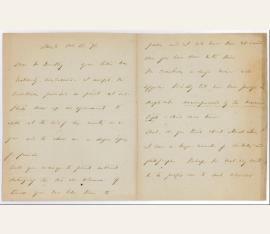 Autograph letter signed ("R. F. Burton"). Trieste. Small 8vo. 3½ pp. on bifolium. On his blue notepaper with his Arabic "Hadji Abdullah" heading, marked "Private". 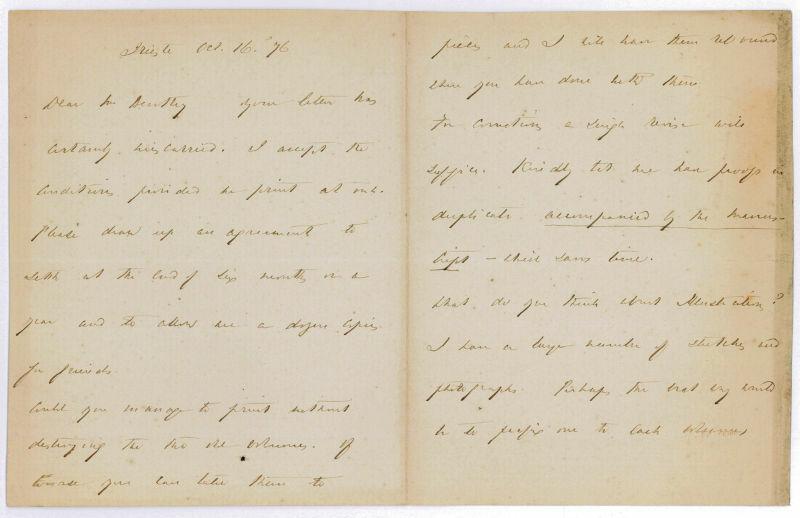 To "My dear Green", congratulating his correspondent on a promotion ("your services amply deserve it") and recommending that he secure an equivalent position "in some decent country". He mentions enclosing "a pamphlet showing the result of my last Expedition" - perhaps one of his visits to the Middle East or West Africa hunting gold - before reporting his wife's illnesses, and asking if a "Sale" is related "to the Sir Robert of Jelealabad" (i.e., Sir Robert Henry Sale, who died in 1845 as commander of the garrison of Jalalabad). "Is there any thing I can do for your here? [...] Any chance of any of you coming to Trieste? [...]" - Old horizontal fold; traces of mounting at lower edge of pp. 2 and 3. A well-preserved example..